1. Pope Francis' love of football started when he was a child in Argentina. Both the players and the fans pray during the games. 2. Pope Francis’ hero was René Pontoni (1920-1983), who played for San Lorenzo in 1946 as they won the national title. 3. Pope Francis has good memories of going to games with his father in the Gasómetro Stadium. This was known as Club Atletico San Lorenzo de Almagro. It was founded by Padre Lorenzo Bartolome Massa in 1908; who allowed young people to play on church property instead of in the streets. 4. Pope Francis is a card-carrying member of the San Lorenzo Club. He has renewed membership annually since 2008, even as pope – (ID No. 88235). The San Lorenzo team had “Papa Francisco” badges on their jerseys during a game when San Lorenzo scored a 1-0 win. 5. 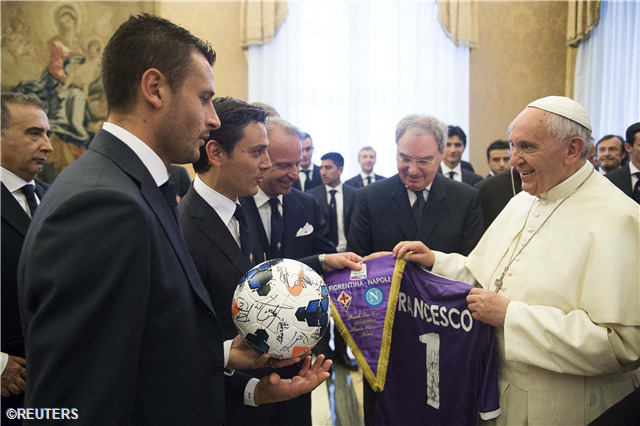 Agentina's national team met with Pope Francis in August 2013 and took a photograph with him. 6. Pope Saint John Paul II is often prayed to by football fans as he also liked the game. Pope John Paul II was canonised by Pope Francis in April. John Paul II often played goalkeeper in his hometown of Wadowice, Poland.